Don’t you just hate it when car companies bring out a new car and charge through the nose for it? Well, that’s not the case with the next-generation Commodore, despite its stunning looks, huge list of high-tech features and great driving dynamics. Next-generation Commodore pricing begins at just $35,990 (driveaway) for the entry level LT 2.0-litre turbo, which is $3,935 less than its base model predecessor, Commodore VFII Evoke (at driveaway). 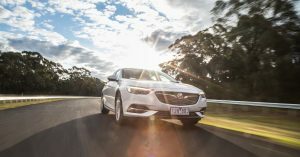 “The next-generation Commodore is a stunning vehicle that’s already getting rave reviews in Europe in Opel Insignia guise,” says Holden executive director of marketing Mark Harland. “It looks sleek and sporty on the outside, while inside it’s refined and sophisticated with intelligent use of premium materials and a long list of user-friendly high-tech features like Adaptive Cruise Control, Apple CarPlay/Android Auto and wireless phone charging. While Holden has rested the famous SS badge, for the time being, there is still a familiar name sitting within the range – the much-loved, Calais. Heading up the sports side of the range is the 3.6-litre V6 AWD, Commodore VXR that delivers performance in a new way for Commodore, with Continuous Damping Control suspension, front Brembo brakes and Adaptive AWD – the first time AWD has featured across the Commodore range. Adding to the great driving dynamics is the priceless amount of work local Holden engineers have undertaken – on the V6 AWD models in particular. The local testing kilometre count is fast approaching 150,000km – enough to circle the world almost four times – focusing on a unique local suspension and steering tune to fine-tuning radio and satellite navigation reception. But local testing isn’t just about engineers shutting themselves off from the world – Holden has asked Commodore lovers for their feedback as the evolution of an icon nears completion. “We’ve hosted over 400 customers at the Lang Lang proving ground in the last few months to show them the next-generation Commodore in development and get their feedback on how it drives,” says Holden vehicle development manager Jeremy Tassone. The all-new Holden Commodore will be available from Holden dealers nationwide – including local dealer Paul Wakeling – from late February.